4) When ready to eat: shake jar, pour out on a plate, and enjoy! 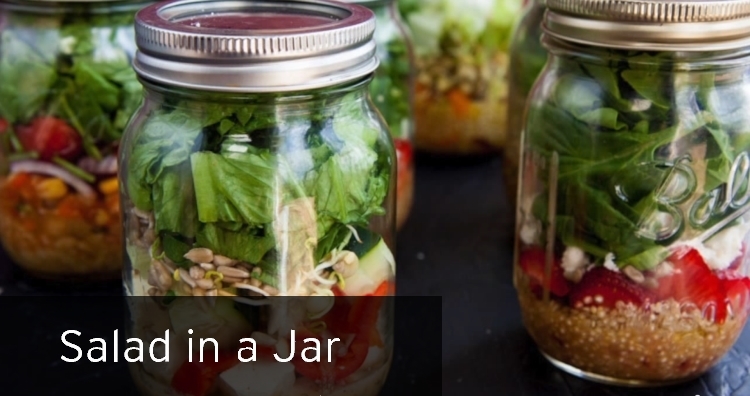 You can make any jar arrangement you would like… add radishes, peppers, peas, jicama, etc. Always remember to put the dressing at the BOTTOM and the lettuce at the top—a MUST. After you pour the salad on your plate you can add the soft vegetables and fruits like tomatoes, cucumbers, red onion, strawberries, blueberries, etc.